Rum Run Deluxe Unboxing, Early Play, & Puzzles! Win a FREE Copy of Rum Run! Today, I finally sent out the SECOND copy of the game. The first was to myself back in May. This coveted copy–complete with the latest artwork and all sorts of extra pieces–goes to Morgan Shaw, my lead graphic designer and co-conspirator. You wouldn’t know it from looking at the differences in the May version of the game and this one, but we’ve actually been meeting regularly most Mondays over Skype to discuss everything from a recent playtest that may warrant a rule adjustment, to the number of colors we should be using in Event Cards. Oh, right. There are Event Cards now. The game is essentially done. All that’s really left now is to make a couple more decisions on the pieces (barrels or cylinders?! 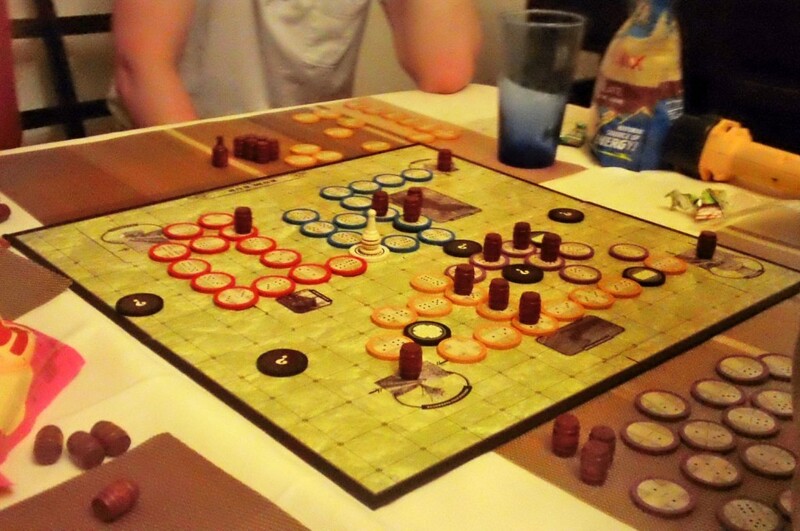 ), and create a beautiful, elegant, clear rulebook. I’m still hopeful we will be able to publish the final game in time for Christmas shipping. That may seem hilarious later, but for now, I’m optimistic. In normal Dominos, all players select their pieces from the same communal pile. In this, every player selects their pieces from their own separate piles, composed of identical sets of pieces. Everyone’s pieces are public knowledge. The game board creates a restricted space for play. Players’ trains need to stay within that space, turn using doubles/crossroads, and if they hit the end of the board, that path is dead. Also to that effect, you can break opposing players’ roads in the same manner as in Rum Run. Barrels are used to denote ‘open’ trains. All the flippables can still be used as fun little random elements. Since barrels don’t mean anything in the game, you can play so that if you discover a single or double barrel flippable, you can remove one or two of the pieces in your inventory. 2) Changed the distillery cards from poker cards to 3.5″ square cards. Morgan and I both agreed that the poker cards make the distilleries look too tiny and insignificant There’s also something about distinguishing the distilleries from obstacles and making them big square things that I really like. 3) Changed the ‘blank’ tokens to ‘asterisk’ tokens. Hopefully this will stop confusion about if the doubles tokens have a wild card component to them. Blank = same as whatever else is on the tile, asterisk = equivalent of blank scrabble piece. Still working out what to call these asterisk pieces. Maybe mercenaries? Guns for hire? Local, untrained townspeople kept in the dark of your operation? Hm… maybe something more stealthy. The idea is meant to be they hide in the trees and wear intimidating clothing and therefore can appear as any strength from 1 to 12, but in reality they are extremely weak. 4) We’re now calling road tokens ‘gangs’. This is to clear up language when referring to a road (a series of road tokens) and a road token (a single token). This also should reinforce the notion that the dots on the dominoes represent folks under your employ who allow for safe passage of your barrels, some of whom are more effective than others. 5) Obstacles now have a little trailhead-esque title. 6) Some players don’t like a game with a chess-level requirement of focus and foresight. That’s what chance-elements are for! Reversals of fortune can bring back a struggling player, or handicap an about-to-win player. For players that like this kind of thing, I’ve created Event and Objective cards. Event Cards are cards you turn over whenever you flip a flippable, score a barrel, or empty a distillery (or maybe just one of those…). They affect everything from the barrels on your road, to the gangs of other players, to the distilleries in play. The distillery event cards were particularly fun to make since they’re so specific. I would recommend players read all of these cards carefully before choosing what distilleries they want to have in play. It’s probably good to know that Fort Firewater can explode. The objectives are similar to games like Innovation, Metal Gear Solid: RISK, or Catan. Some reward you for being the first person to do something, others reward you for having something when they game is over. They are all worth barrels, which are basically victory points.